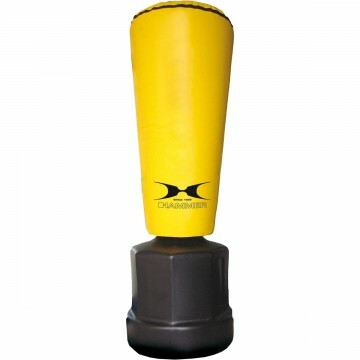 Outside, inside, at the office or in the cellar, you can set up the standing punching bag anywhere. 3 height adjustments (162, 177 and 192 cm). Whether outside or inside, at the office or in the basement, you can set up the Impact Punch standing punching bag anywhere. The large stand with a 55 cm diameter can be filled with water, sand or gravel and won't fall even with the hardest of hits. You can adjust the Perfect Punch ideally to fit any body size with 3 height settings (162, 174 and 192 cm). The standing punching bag is very solid and consists of low-maintenance PU material. You can train every hit and kick combinations 1 on 1 with the standing punching bag thanks to the large targets.